Farsight Security provides real-time actionable cybersecurity data solutions for threat intelligence, SOC and incident response teams. Leveraging a diverse, global sensor array to collect, aggregate and process over 200,000 DNS resolution observations per second, real-time data is made available through the Security Information Exchange (SIE) platform, where it is offered in a variety of real-time solutions and specific data alerts. Over two terabytes of DNS archived information daily is also captured. This data includes over 100 billion domain resolutions. 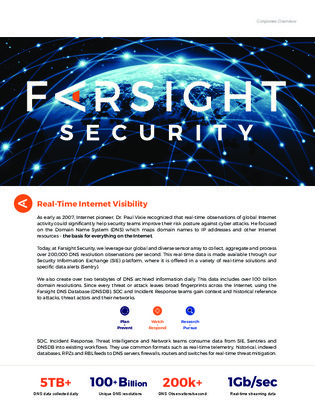 Since every threat or attack leaves broad fingerprints across the Internet, using the Farsight DNS Database (DNSDB), SOC and incident response teams gain context and historical reference to attacks, threat actors and their networks.